The Aidensfield Arms is the pub in Heartbeat. It is a focus for the Aidensfield community. 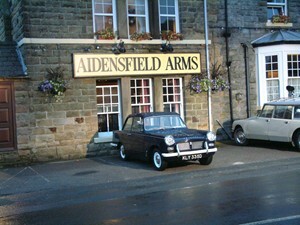 Episodes of Heartbeat often end over a pint in the Aidensfield Arms. In Heartbeat the landlady of the Aidensfield Arms is Gina Ward, played by Trisha Penrose. The owner of the pub is retired police sergeant Oscar Blaketon, played by Derek Fowlds. The car in the picture, (left) is a Triumph Herald. It is one of a number of cars seen around the village of Aidensfield. It does not belong to any of the characters. To the right of it is the Citroen Safari belonging to Dr Helen Trent, played by Sophie Ward. The doctor is a regular at the pub, along with her new husband PC Rob Walker (Jonathan Kerrigan). You can imagine the Aidensfield Arms as a typical Yorkshire pub in the 60s. It is the kind of place to enjoy a drink after a long walk on the Yorkshire Moors. 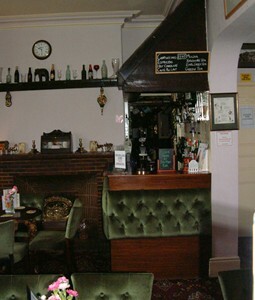 Left, the bar at the Goathland Hotel, aka the Aidensfield Arms. Although, a modern bar, this bar is not too dissimilar to a bar from the late sixties. In reality, the pub scenes in Heartbeat are now filmed in a studio. The Goathland Hotel was used in some of the earlier episodes.